Home > Welcome to Smile Fish! Smile Fish, located on Iriomote Island in Okinawa Prefecture, is pleased to provide friendly and courteous guided diving services in the seas of Iriomote Island every day, for which it has an established reputation. English-speaking staff members (instructors) are permanently stationed and welcome many guests from overseas. Our hope is that you can fully enjoy the oceans of Iriomote Island—which feature world-class, beautiful coral—with no language-related concerns. 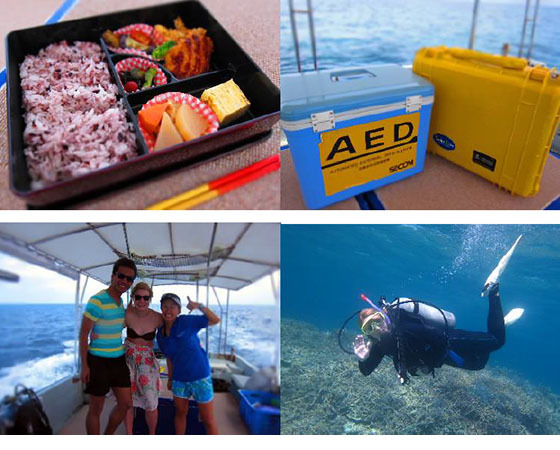 We look forward to diving with you and sharing smiles from Iriomote Island! ■ Prices are fixed for each course. 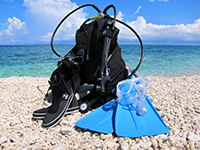 The same prices apply even when not renting wet suits or the three-piece set. Time required for each course includes time for preparations, breaks, etc. Lunch boxes will be served on the boat (included in the prices). * All rental equipment prices are for one day. Rental equipment fee, facility usage fee, bath towel rental fee, lunch (One-Day Course only) * You may bring your own mask, fins, boots, etc. However, the set price will still apply. Excluding cases in which coursesmust be cancelled (due to ocean conditions, weather, etc. ), a cancellation fee stipulated by Smile Fish is applicable for cancellation due to customer’s personal circumstances, etc. Iriomote Island has amazingly beautiful coral! If you can’t speak English, we’ll do our best to communicate via gestures! If you have any questions, please feel free to contact us by telephone! Make your Online Reservation by filling out our booking form below. Please state which activity would like to book, any useful information, along with the number of people in your group. *Please note this is a booking request only. Our reservations department will confirm your booking within the next 24 hours, pending availability. Once your booking availability has been confirmed, we will send you a Booking Held Notification which includes instructions on what to do next to confirm your reservation. Thank you for choosing Smile Fish diving service. We look forward to meeting you!